I’m a strong believer in apprenticeship as a paradigm for learning anything. 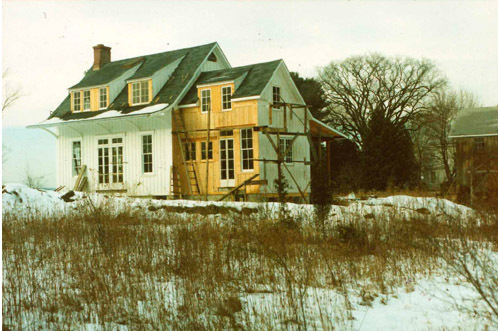 Much of what I have put into practice in woodcraft and architecture I owe to my friend and mentor, George Smith of Tivoli, New York, with whom I worked side by side building small houses and furniture over twenty years ago. Constructed over the course of two years, the house pictured above is where George raised his young family. In a traditional craft training like my own, learning to pay attention to more than the work at hand begins with apprenticeship. “Apprentice” shares roots with “apprehend” which means “to become conscious of, as through the senses; to perceive”. My relationship with woodcraft and with my mentor was pure sensorial experience. A good apprentice does not think so much as trust the teacher to bodily train in the sensibilities of the craft, however obliquely relevant at the time. To this day, the most valuable lesson I gleaned as an apprentice over twenty years ago is that on a staggeringly lovely day it’s best to close the shop and find a swimming hole. To follow the thread of my most recent architectural project, please click here and scroll down. Posted by Scott on December 18th, 2009, at 9:07 am, and filed under all, daily handwork, Marin Residence.